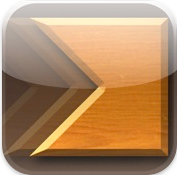 Cross Fingers iPhone App Review. I re-iterate my previous post. It's puzzle-mania for me! 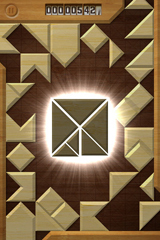 Now I'm back to Tangrams (I was totally in the dark about this ancient Chinese game until LetsTans), but currently found a new appetite for this type of puzzles. Thankfully, Cross Fingers is here to quench my hunger, and I'm here to tell you that it's a doozie. 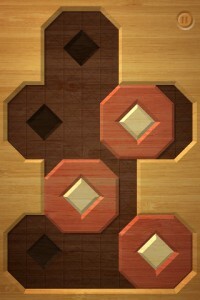 The game will have you twisting and twiddling your fingers in no time, hence a really effective name: Cross Fingers. 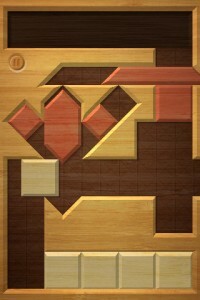 The game borrows some of the ideas from the Tangrams puzzles, but offers a completely new twist to the game. Instead of placing pieces altogether to fit a specific shape, or finding the shape amidst all the tiles on the board, the twist here is that the whole board is a trap. You're given the task to fit pieces available on the board onto a given shape, but you can only do this by sliding the pieces towards that shape. The path is not (always) clear, so you might need to slide some pieces out of the way before you can reach the destination and complete the Tangram. The trick is to think carefully what you slide and where you slide it, lest you close the gap and have to start over. The real magic behind it is the game's multitouch functionality. The way you slide a piece is self-explanatory, but sliding one piece to move another through the gap requires you to do this simultaneously, using two fingers. At first, you can do fine with one or two fingers, but progressively, as obstacles are introduced, you'll be needing all your fingers to go through levels. Now, how exciting is that?! In all honesty, Cross Fingers displays a brilliant use of the iPhone's multitouch capabilties, and fitting all your fingers on the screen requires some dexterity. One wrong move, one finger not touching the piece, and it springs back to its original location and you're back to square one. With Cross Fingers you get over 120 levels for your enjoyment, which practically leads to countless hours of finger twisting and brain squeezing. The developers also warn of an unlocakble game mode - Arcade - which puts you in the middle of a frentic machine and you have to survive and beat the top score. I personally didn't get to that point yet, but I'm having so much fun with Cross Fingers that I'm not playing with a specific goal in mind. Feel free to think of Cross Fingers as a combination between UnblockMe! and Tangrams, but with Multitouch involved, a combination that truly worked great and provided hours of enjoyment and finger (and brain) twisting. The game sells for $0.99 with a free version available in the AppStore for you to try out. What do you think of Cross Fingers ? Scroll down for our comment section and let us know!.